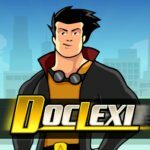 DocLexi TM is an app, inclusive of an option and web based access for therapists and teachers, with the objective of helping struggling readers and those with early signs of dyslexia building on proven therapeutic concepts. DocLexiTM was developed by experts with years of experience in working with children to help improve their reading and spelling skills and is based on proven concepts. My role in this project was more than just artist. For a 1st time I have worked as producer and had to care of whole developing process: workflow, game design, communications in between all participants as programmer, therapists, investors over music composer up to QA. Beside this position I was responsible for all visuals.